The first Grand Slam of the year is a really important event as it determines the tone for the new season of competitions. It sets a new Grand Slam Ranking that will bring the top 12 couples to the Shanghai Grand Slam Finals on 7-8 December 2019. The Dancesport Life team was present at this historical event seeing that it was the first Grand Slam ever organized by Romania. We were truly impressed by the quality and enthusiasm of the dancers and by the dedication of the DanceMasters organizers. If you want to see us interviewing some of the top 12 WDSF couples make sure to subscribe on our YouTube channel as we are going to post the interviews there soon. We were super curious to see how did the dancers (and not only) feel about one of the most important events of the year. What better way to do that than to ask them directly?! There was a new scenario in the Standard, on Saturday, where for the first time after the long-reigning period of Dmitry Zharkov and Olga Kulikova winning 20 Grand Slam titles, judges had to choose their successors. All the expectations, of course, were on Evaldas Sodeika and Ieva Zukauskaite (LTU). They won their first Grand Slam title of their career with 3,546 points of difference from the runners-up Francesco Galuppo and Debora Pacini (ITA). It must be underlined that Evaldas and Ieva received four “10.0” and six “9.75” in Slow Foxtrot in the Final. That’s impressive! In Latin American instead, as in 2018, the fight between the top two couples Tsaturyan – Gudyno and Balan – Moshenska continued. The results were really unpredictable until the very end. 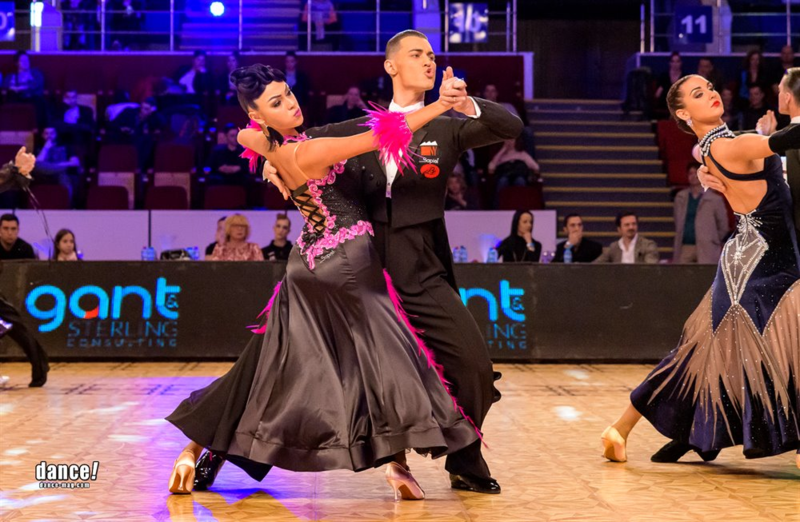 In the Final, they were equal in Rumba and only 0,041 apart in Jive. But at the end, Armen Tsaturyan and Svetlana Gudyno (RUS) won by only 1,122 points away from Marius-Andrei Balan and Khrystyna Moshenska (GER). The competition has been held in the Sala Polivalenta, a 5300+ seats hall, just a few kilometers from the center of Bucharest, Romania. When you enter the building, you don’t see immediately the floor, because you are in the area behind the tribunes. There, you can find all the dancesport-related shops, some cafes and some food providers. The changing rooms for the athletes are downstairs, so is the warm-up floor and the main dancing floor. All around the dance floor organizers placed evening-gala tables with catering service that perfectly recreated the warm atmosphere of an elegant ballroom hall. It was great because it filled the gap between the dancers and the spectators from the tribunes. As the evening session started at 19:30, the seats on both sides of the hall were full and all the tables were occupied. We hope you enjoyed this year’s edition of the DanceMasters Bucharest Grand Slam. And if you weren’t present this year, make sure to come in 2020!